Learn more about the Egtved Girl and her “bog body” cousins with our video. Teachers, scroll down for a quick list of key resources, including today’s MapMaker Interactive map, in our Teachers’ Toolkit. Still a teenager when she died, the remarkably fashionable Egtved Girl was laid to rest about 3,500 years ago. She was buried dressed in a cropped wool bodice with flowing sleeves, a short skirt, and bronze bracelets and earrings. The large bronze disc on her woolen belt probably represented the sun. The Egtved Girl was buried with a birch-bark box containing an awl, bronze pins, and a hairnet. A bark bucket in her coffin revealed traces of Bronze Age beer—made with wheat, bog myrtle, berries, and honey. Visit today’s MapMaker Interactive map to better appreciate the travels of Egtved Girl, and experiment with layers to discuss Bronze Age transportation, land-use, and climate. 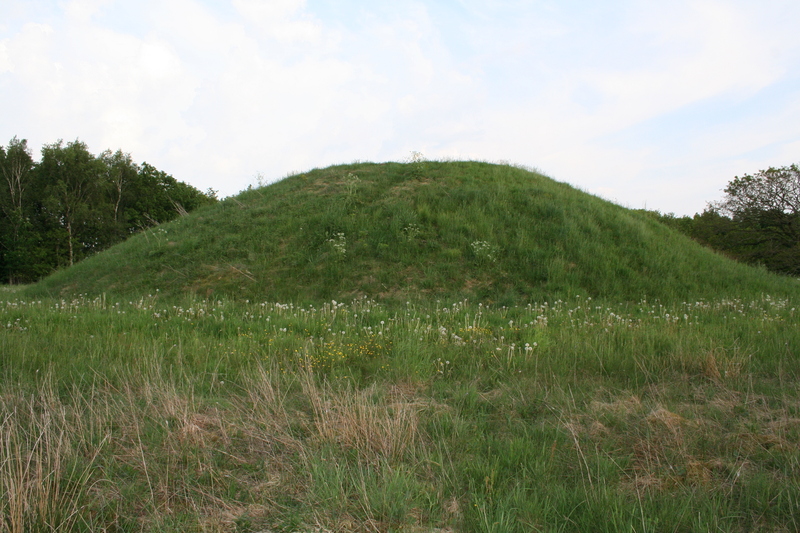 The Egtved Girl was carefully buried in a barrow, or burial mound, like this one in Egtved, Denmark. Watch our terrific, short video on Northern Europe’s “bog bodies.” Do you think the Egtved Girl qualifies as a bog body when she wasn’t actually buried in a bog? Probably. Like more traditional bog bodies, the Egtved Girl was an “accidental mummy” preserved by the chemistry of the soil. Also like most bog bodies, there is some evidence that ritual human sacrifice may have been responsible for Egtved Girl’s death, the death of the cremated child buried with her, or both. The Egtved Girl was buried in a coffin—the carefully hollowed-out trunk of a large oak tree. She was covered with a woolen blanket and placed on a cowhide sheet. A yarrow flower was placed on the coffin at the time of her burial—revealing that the Egtved Girl was buried in summer. An analysis of the coffin using dendrochronology (the study of tree rings) was used to date the remains. Only the girl’s hair, brain, teeth, nails, and skin were preserved. The cremated remains of a 5- or 6-year-old child were also buried with Egtved Girl. Given Egtved Girl’s age, the child was almost certainly not her’s. What characteristics of Jutland’s wetland soil helped preserve Egtved Girl? Take a look at the Educator version of our “Bog Bodies” video for some help. How do scientists know Egtved Girl was such a cosmopolitan traveler? This fantastic drawing depicts the sampling strategy used to reconstruct the lifetime travels of Egtved Girl. Scientists sampled tooth enamel to reconstruct the first years of her life, segments of scalp hair to reconstruct, at least, the 23 final months of her life, and segments of one of her fingernails to reconstruct the final approximately 6 month of her life. How did scientists measure strontium levels in Egtved Girl? Soil: Soil from the burial site provided a local baseline by which to judge any variations in the strontium levels in coffin. Human remains: Scientists analyzed a sample from one of Egtved Girl’s teeth, three samples from her thumbnail, and four samples from her hair. They also analyzed the cremated remains of the child buried with her. Clothes and other textiles: The strontium in Egtved Girls’ blouse, skirt, belt, and slippers were measured. Scientists also analyzed the woolen bundle in which the child’s ashes were wrapped, three samples from the wool-and-oxtail cord buried with the child, the oxhide sheet on which Egtved Girl was lain, and three samples of the blanket that covered her body. This map of Northern Europe depicts the patterns of inter-chief alliances during the Bronze Age,. The map shows the distribution of characteristic octagonal-hilted swords from the Bronze Age (black dots) combined with homelands of local elite groups/polities (circles), and with intermarriage patterns with foreign women (arrows pointing to the respective women’s origin). The red star marks the Egtved site. Why do researchers think Egtved Girl was such a seasoned traveler? Previous Previous post: Top 10 New Species!